MyRightWingDad.net: FW: The Magic Green Hat... AN OLDIE BUT TIMELY NOW! FW: The Magic Green Hat... AN OLDIE BUT TIMELY NOW! Subject: Fwd: The Magic Green Hat... AN OLDIE BUT TIMELY NOW! Subject: Fwd: FW: The Magic Green Hat... AN OLDIE BUT TIMELY NOW! I put on my MAGIC GREEN HAT. When I went into the E.R., I noticed that 3/4 of the people got up and left. I guess they decided that they weren't that sick after all. It cut at least 3 hours off my waiting time. It also works at Dept. of Motor Vehicles. It saved me 5 hours. The whole crew ran out the back door and I never did get my order! This entry was posted on 5/17/2017 03:30:00 AM and is filed under IMMIGRAtion , MAKING FUN OF MINORITIES SURE IS FUN , U.S. BORDER . You can follow any responses to this entry through the RSS 2.0 feed. You can leave a response, or trackback from your own site. 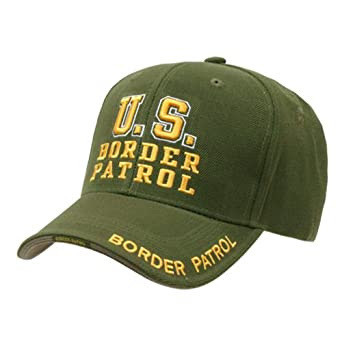 I'm not sure why anyone would fear someone wearing a Border Patrol hat if they weren't in the act of trying to cross the border. Then again, a lot of the way RWD thinks is lost on me. To CharlieE: I live and travel around the SW, and the Border Patrol shows up in a variety of places, not just at the Border. Typically, though, it is ICE that goes after undocumented workers, although these days it may also sometimes be the local PD. So there's some validity/reality to the "joke." Of course, this follows the 40 years+ of conservative propaganda about undocumented workers, who are over-filling ERs, which causes RWD to have to wait for treatment. Heaven forfend! Whenever I've gone to the ER, which is mercifully infrequently, I haven't seen a plethora of brown people, so this is a bogus, but effective, trope about how all the undocumenteds iz stealin' services wah wah wah. Of course, RWD never gets around to blaming, for example, the owner of the CrapDonald's franchise for putatively hiring undocumented workers. Nay verily, RWD just wants to focus on the workers who "stole" jobs from US citizens. Don't go after the owner, who, technically, is more responsible. Just go after the brown people. And so on, blah blah blah, lather rinse repeat and feel ever so smug at your clever racist ways that never solve one damn thing. If I was this full of hate, I'd seek therapy. Poor RWD. In the ER for that head injury, were you...? More likely, they ran cause they didn't want to deal with you. A photo of an ICE hat would have made for a better joke. But then again, no one has ever accused RWD of being funny.